Do you need a dental cleaning or dental procedure? Are your nerves keeping you from scheduling or showing up to your appointment? Maybe you know that you could benefit from visiting your dentist, but you suffer from dental anxiety. If you’ve been putting off your visit, the team of Avenue Smiles is here to help. We make visiting the dentist easy and anxiety-free by providing sedation dentistry. Now you can get rid of your toothache and your health concerns by enjoying a quick and stress-free appointment. Dr. Agarwal and her team members have successfully helped many patients overcome their fear of the dentist by making each appointment a great experience with nitrous oxide sedation. What is Nitrous Oxide? Nitrous oxide, also known as laughing gas or sweet air, produces a euphoric and relaxing effect. Nitrous oxide is safe enough to use in dental procedures for both children and adults. What Does Sedation Dentistry Require? Come see Dr. Agarwal to talk about sedation dentistry. At our office, benefitting from sedation dentistry requires absolutely no work on your part. When you sit in the chair, we will administer the nitrous oxide to you through a mask that is placed over the nose. You will breathe in the nitrous oxide and quickly feel light and relaxed. Will I Remain Conscious? Nitrous oxide allows you to remain conscious during your procedure, but without being worried or uptight. You will be able to talk to your dentist without feeling concerned about the procedure or feeling any discomfort. How Long Do the Effects Last? The effects of nitrous oxide will quickly wear off after the removal of the mask, so you can get back to feeling like yourself in no time at all. Nitrous oxide is so gentle that patients can even drive themselves home after their time with us. If you think sedation dentistry could benefit you, give us a call. We are happy to help and can’t wait to give you the stress-free dental experience that you deserve. I have never had so much fun at the dentist! I love Dr. Agarwal and her awesome staff, especially Devin, Alicja and Janette! ☺ I needed a lot of work done, and they made me feel so comfortable and relaxed. I laugh and smile (in between drilling..ha ha) almost the whole time I'm there. I feel so lucky to have found this awesome dentist and will be recommending Avondale Smiles to my patients and my friends. They are professional, thorough, highly skilled and very laid back and full of personality! I visited Dr Aditi and I liked her approach and diagnosis. The staff is very polite and cooperative.I would strongly recommend her .The environment in her office is very positive and it gave me full confidence that am at the rate place. 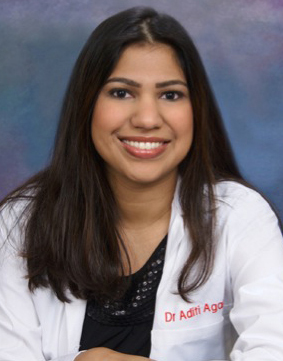 Dr. Aditi Agarwal runs a modern set up in a convenient location. I found the care and skill of Dr. Aditi and her assistants to be top notch – the best I have received in the last 20 years. Dr. Agarwal is the best dentist I’ve seen. I’ve had trouble getting numb in the past, which at times has been traumatic for me. She’s made me feel very comfortable... I’m now much less anxious about going to the dentist. Dr. Aditi is the best dentist I have ever been to. I went to see her when I cracked my tooth, and she performed a root canal on it. I was terrified and she really calmed me down. She was gentle, compassionate, and very kind. I was amazed at how social they were they made me feel at home and welcomed. They didn't let you feel lonely asking questions here and there just making a friendly conversation. The dentist was fun and treated you like family. I want my teeth this clean every day. They are a friendly group of people. They are great at there jobs. I get to go back for my crown. I'm not even worried. Thay are that good! Great service and easy access for amazon employees working in Seattle down. I got my cavities removed here with no issues. Dr. Priya and staff are great! The Dr. always explains and answers every question and I never feel nervous for treatment. Becky makes scheduling super easy. Very convenient location for me in the Downtown area. I was very impressed by the service and care of Avenue of Smiles! Both Dr. Sonya and Dr. Aditi made a huge effort to accommodate me. I had a short time for the treatment and not only did they speed u the laboratory but accompanied me to the lab and ensured all went as per plan. They took time off their lunches as well as came in early to help me get my treatment finished. Their work is very professional and well priced in comparison with their competitors. They explain every step of the process and I felt very well informed at all times. At last, their office culture is welcoming and friendly and their location is central. I have been a patient here for more than a year now and have seen all doctors/assistants and have always been satisfied with my experience from making an appointment to getting the treatment done. It is a very professional and clean clinic. The staff and doctors are approachable personally made it easy to ask any questions or raise any concerns that I had with recommended treatment. Apart from regular cleanings I needed a Root Canal done and I experienced the most efficient painless treatment compared to my prior root canals. I highly recommend this place to everyone looking for a dentist in the area and closer to work.